I think it is over imagination what you can create out of the pallets. Recycled pallets can be useful in so many ways which is getting beyond my expectations. 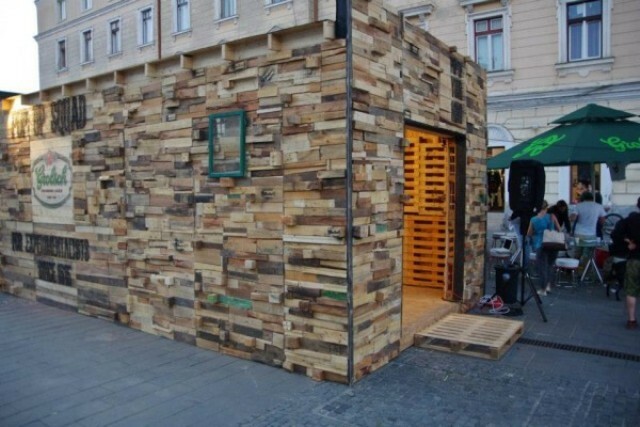 Wood art pavilion from recycled pallets is the best example of that. You can simple attach the pallet woods together which looks beautiful. The sitting area beside is outdoor for the people to enjoy as they eat there. It looks awesome but if you start with it, it will surely take some time more than usual things take to be building out of the pallets. I only used to think that pallets can be best for the furniture but if you want to add beauty to the pavilion then I think pallets would be awesome for that as well. It gives a unique and rusty look making it attractive for the people. You can attach frames on it to make it dressy. Even the door step has pallets there so that one can step on and get inside the wood art pavilion. I love this idea and I think the next thing I would consider is to give the pallets look to something I would like to build in an outdoor space.